Audi brings a little extra bite to the Big Apple today as the first ever five-door Sportback version of the mighty RS 5 makes its world public debut at the New York International Auto Show. The latest high performance, high technology addition to the Audi Sport stable is set to take its place alongside the more familiar RS 5 Coupe, combining its arsenal of blistering 450PS bi-turbo V6 power and quattro all-wheel-driven tenacity with spacious five-seat accommodation and ample 480-litre luggage capacity. The exterior design of the new Audi RS 5 Sportback is a blend of elegant curves and taut, athletic surfaces. The longer wheelbase, short overhangs and long, wraparound bonnet with power dome all help to signal intent, as do the characteristically powerful shoulder line and the quattro blisters in the flanks which emphasize the strong bulges over the extended wheel arches. 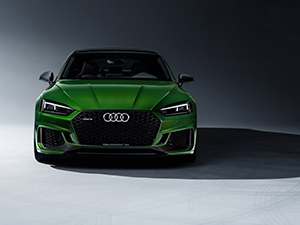 At the front, the Audi RS 5 Sportback features a wide, flat single-frame grille, solid air intakes with a honeycomb structure typical of an RS, gloss black design elements and a front spoiler with matte aluminium quattro lettering. At the rear an RS-specific diffuser insert, RS exhaust system with oval tailpipes and fixed spoiler lip further distance the car from its A5 series siblings. 19-inch wheels are standard, and the list of optional extras contains upgrades to various 20-inch designs, as well as personalisation features such as optic packages in Gloss Black, Carbon, and Matte Aluminium. With 450PS and 600 Nm (442.5 lb-ft) of torque deployed throughout a wide speed range from 1,900 to 5,000 rpm, the new 2.9-litre V6 powering both RS 5 variants delivers slingshot performance that is reflected in a 3.9-second 0-62mph sprint time for the new Sportback and the potential for a top speed of up to 174mph. * Two turbochargers positioned centrally between the cylinder banks guarantee exceptional response throughout the rev range, and combustion technology employing the B-cycle process with central direct injection promotes a level of efficiency that is at odds with the prodigious power output. That output is deftly managed by the eight-speed tiptronic transmission with optimised shift times and by the RS-specific five-link suspension, which is of course supported by quattro permanent all-wheel drive. As an alternative to the standard set-up Audi Sport also offers RS sport suspension with Dynamic Ride Control (DRC) featuring adjustable, electronically controlled damping, along with features such as ceramic brakes and dynamic steering with RS-specific tuning. The centre differential-based quattro system has a 40:60 front-to-rear bias favouring agile, adjustable handling with optimal traction, and when tested by challenging conditions can channel up to 85% of power to the front and up to 70% rearwards. In UK specification models the system is augmented by the quattro sport differential acting on the rear axle for even more precise power management. The operating characteristics of the quattro system and many other elements of the driving experience can be tailored to the driver’s preferences via the standard Audi drive select control. The credentials of the five-door high-performance coupé are emphasized in the high quality interior by details such as the RS sport seats in Fine Nappa leather with honeycomb stitching, the flat-bottomed RS multifunction sports leather steering wheel and the special RS information displays in the standard Audi virtual cockpit providing information on tyre pressure, torque and G forces. The cabin provides space for five people, and the square-shaped profile of the luggage bay with its useful width of exactly one metre allows passengers to make the most of the 480 litre luggage capacity. Folding down the rear seats with their 40:20:40 split ratio increases that to 1,300 litres.